This pioneer family of the Scotch settlement on the shore of Lake St. Clair first came to Canada in the early part of the nineteenth century. 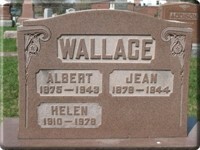 Alexander Wallace, who was born in Fifeshire in the year 1800, immigrated to Quebec as a young man and worked as a carpenter. While he was living there, he met and married Jane Dickson, an immigrant girl six years his junior whose family had come to Toronto in 1831. The couple moved to Windsor in 1834, and Alexander continued to work as a carpenter and joiner for a few more years. 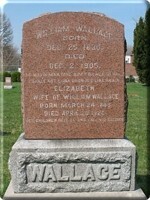 In 1838 he set upon the life of a pioneer farmer, buying land in Maidstone Township on the lake shore in Essex County. With the assistance of his two sons, Alexander and William, he cleared off 100 acres of bush and built a house, a barn, and outbuildings. The second child of Jane and Alexander Wallace, William was born in Windsor and grew up on the Maidstone farm, where he learned the value of a hard day's labour at a very young age. He later went to Detroit and worked in the saw mill for some years, but returned to his home town in 1872. He bought the family farm from his father, in preparation for his marriage to Elizabeth Thompson, a twenty-four-year-old Glasgow native who had come to Canada six years prior.